We build recruitment agency websites and job boards that perform. Easy to update, easy to search and simple for candidates and clients to use. In such a competitive industry, the quality of your website speaks volumes for your business. We are experts at creating market leading recruitment websites that increase sales. Placing you at the heart of the design process, we can integrate your CRM and job aggregator, and add powerful job search functionality. These features combine to create a professional experience that is centred around your workflow. The projects in our portfolio have seen increased traffic and client retention, thanks to careful planning and a streamlined, easy to use website. Plus, with less admin bogging them down, your consultants will have more time to focus on what they do best. We are experts when it comes to recruitment. With years of experience and an exciting client list, we have the knowledge that matters. We know how to build a recruitment website that works for you, saves you time and helps you stand out from the crowd. Your website should solve business problems, help you gain traction and allow candidates and clients to find the information and opportunities they need. Having a website that will grow and change with your company is important. 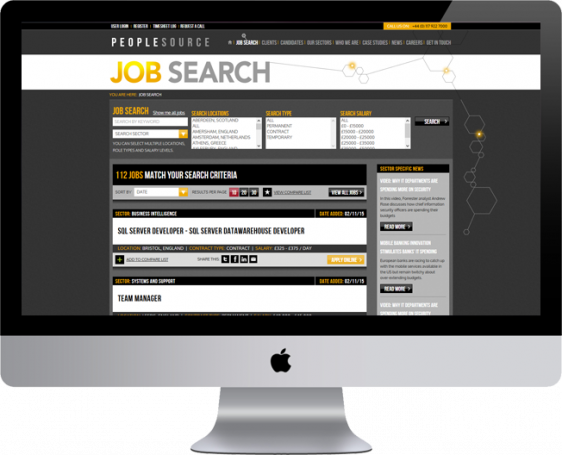 A recruitment website built by Applecado gives you control over website pages and their content. Whatever you need to update, whether it's consultant bios or the job sectors catered for, we can give you the power to change. We have the expertise to integrate with job aggregators such as Broadbean, which can really take the effort out of distributing and organising jobs, searching and filtering through applicants. We'll liaise with your aggregator on your behalf to save you valuable time. Wouldn't it be great to integrate your new website with your existing CRM system? This powerful pairing of your website and contacts will give you one place to manage all your key relationships - giving consultants more time to focus on making hires. Candidates need to be able to find their dream job, quickly and easily. A job search can easily be tailored to your market, allowing candidates to filter results by location, salary and more. This means that the right job won't be missed or overlooked. Give your candidates the best experience by allowing applicants to register on the site, and keep a CV on file. They can then keep a shortlist of jobs for comparison, for example, saving them time and effort. Features like these will ensure that potential candidates return to you over your competitors. New jobs can automatically be posted to Twitter, Facebook or LinkedIn as necessary. These connections help project and share your communications with a wider candidate pool, and your team don't have to lift a finger.